The Armed Services Vocational Aptitude Battery Test (ASVAB) is extremely important to anyone who has dreams of putting on a uniform and defending their country. Your score on this test will literally determine what branches and what military jobs you are eligible for. For that reason, it is also important that you understand how the test is actually scored. The first thing you need to know is when it comes to the ASVAB is the AFQT. The combination of your scores in these four test sections – your AFQT score – is used by the recruiter to determine your enlistment eligibility and your military job eligibility. The score can also be used to help you explore your career options. The remaining six sections on the ASVAB are used to drill down and determine what job you are best suited for in the military as these scores will provide in-depth insight into your knowledge, skills and interests. These six sections are: General Science (GS), Mechanical Comprehension (MC), Electronics Information (EI), and Assembling Objects (AO), Auto Information (AI) & Shop Information (SI). Please note: AI and SI are combined into one single score (labeled AS) on the paper and pencil test. There are actually two versions of the ASVAB – a paper and pencil version (P&P) and a computerized version. The underlying model used for the ASVAB is a three-parameter logistic (3PL) model. This model represents the probability that an examinee at a given level of ability will respond correctly to an individual item with given characteristics. The characteristics used are difficulty, discrimination and guessing (this refers to the likelihood that a very low ability examinee would respond correctly simply by guessing). For the paper-and-pencil (P&P) version of the ASVAB, the 3PL model is used to compute final ability estimates for examinees. For the purpose of scoring, any unanswered items are treated as incorrect. AFQT scores, which remember are computed using the Standard Scores from four ASVAB subtests: Arithmetic Reasoning (AR), Mathematics Knowledge (MK), Paragraph Comprehension (PC), and Word Knowledge (WK), are reported as percentiles between 1-99. An AFQT percentile score indicates the percentage of examinees in a reference group that scored at or below that particular score. For current AFQT scores, the reference group is a sample of 18 to 23 year old youth who took the ASVAB as part of a national norming study conducted in 1997. Thus, an AFQT score of 80 indicates that the examinee scored as well as or better than 80% of that nationally-representative sample. An AFQT score of 60 indicates that the examinee scored as well as or better than 60% of the nationally-representative sample. AFQT scores are divided into categories, as shown in the table below. 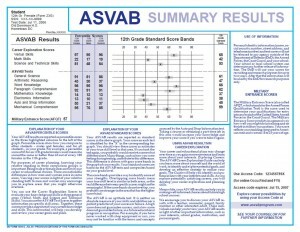 So What ASVAB Score Do You Need? According to the latest figures from The Education Trust, 77% of enlistees between the ages of 17 and 20 years passed the ASVAB with a score of 31 or above in 2010. The best way to prepare to pass the ASVAB is using online practice tests like those offered at ASVABTutor. Let us know if you have any questions in the comments below. 4.1 out of 5 based on 10 votes.